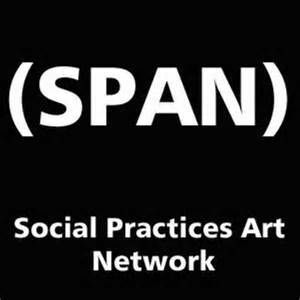 Social Practices Art Network (SPAN) is currently being developed by Jules Rochielle. The intention of this site is to create a resource for individuals, organizations, community groups and institutions that are interested in new genre arts forms and practices. It is meant to serve as a platform for a variety of social art practices. Of Ecuadorian and Chinese descent, Marisa Jahn is an artist, writer, and community organizer who believes that bridging culture and grassroots politics brings about innovative forms of social change. Marisa’s work has been presented in public spaces in the US, Canada, Tajikistan, Kyrgyzstan, Estonia, Honduras, and Turkey and in venues such as the MIT Museum, ICA Philadelphia, The New Museum (New York), ISEA/Zero One, Eyebeam (NYC), the National Fine Art Museum of Taiwan, and in San Francisco at Yerba Buena Center for the Arts, the San Francisco Asian Art Museum, and the San Francisco Museum of Modern Art. In 2009 and 2010, Marisa was an artist-in-residence at MIT’s Media Lab, an artist teacher with Center for Urban Pedagogy, and designer-in-residence at Street Vendor Project, an organization that advances an agenda of economic opportunity, social justice, and civil rights for street vendors in New York City. As an art educator working with underrepresented youth since 1998, Jahn has partnered with and built award-winning education programs with organizations worldwide and was recognized by UNESCO in 2006 as a leading art educator. From 2000-2009, Marisa and Steve Shada co-directed “Pond: art, activism, & ideas,” a gallery-based non-profit organization dedicated to experimental art. In 2010, Marisa, with Stephanie Rothenberg and Rachel McIntire, co-founded REV-, a non-profit organization dedicated to furthering socially engaged art, design, and pedagogy. Marisa is also the deputy director of People’s Production House, an organization that empowers teens and historically excluded communities with skills to become journalists and media justice advocates. Marisa studied at UC Berkeley Massachusetts Institute of Technology (MIT). Her work as an artist and activist has been featured in international media including Art in America, Los Angeles Times, Frieze, Punk Planet, Clamor Magazine, The New York Times, San Francisco Chronicle, Make Magazine, Metropolis, the Discovery Channel, The Wall Street Journal, and Canadian Broadcasting Corporation.